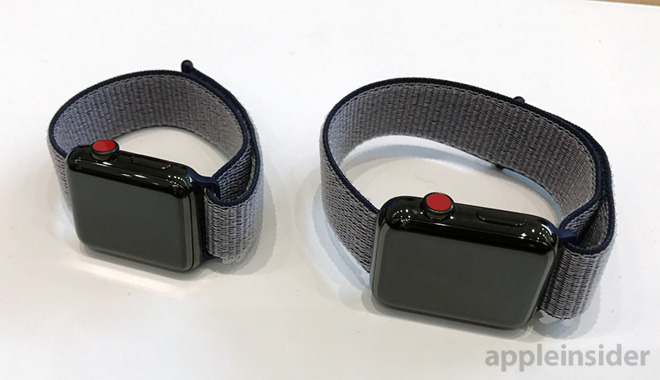 Purchasers of the Series 3 Apple Watch with LTE in China at present have no wireless network connectivity options, with the lone carrier possibly forced by the government to cease service. A report on Thursday from the Wall Street Journal notes that LTE connectivity was cut off on Sept. 28 after brief availability from China Unicom. While not yet confirmed, unnamed industry analysts cited by the report claim that the suspension is probably from governmental concerns about not being able to track and confirm users of the device. Apple issued a brief statement confirming the situation, and referring customers to China Unicom. Neither China Unicom, nor Chinese regulators have made any statement on the matter. The issue may stem from the eSIM in the Apple Watch. Devices like the iPhone have state-owned telecom company-issued SIM cards — and the eSIM is embedded in the device by Apple. "The eSIM (system) isn't mature enough yet in China," one analyst said. "The government still needs to figure out how they can control the eSIM." The LTE version of the Apple Watch had only a trial certificate to operate on the Chinese LTE network. An analyst who asked not to be identified expects that Ministry of Industry and Information Technology may take months to figure out how the government will deal with the eSIM, and issue a formal certificate for operation. In 2015, Apple and Samsung were working with some of the largest carriers in the world on eSIM technology — including China Unicom. The technology is related to, but not identical to the Apple SIM technology in the iPad used by companies like GigSky, to allow users to easily buy temporary, contract-free data plans while traveling internationally.